In 1944, a German submarine located south of Nantucket spotted a convoy leaving New York City bound for Great Britain. The Pan Pennsylvania, a large tanker traveling with the convoy, straggled behind and the German U-550 torpedoed her. The ship quickly caught fire and began to sink. As the Pan Pennsylvania settled, the submarine maneuvered underneath her hull in an effort to hide from the convoy’s military escorts. The Navy and Coast Guard rescued the tanker’s crew and detected the Germans as they attempted to escape. The U.S.S Joyce dropped bombs all around the submarine and severely damaged it, forcing her to surface. 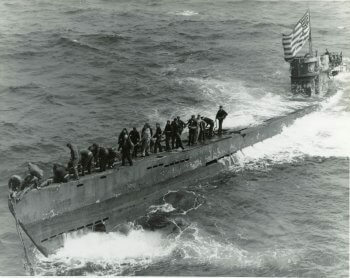 Above the water, German and American sailors exchanged gunfire while the U.S.S Gandy rammed the submarine. Eventually the U.S.S Joyce picked up 13 Germans and the rest of the crew went down with the U Boat. The U.S.S Joyce delivered the prisoners of war and the Pan Pennsylvania survivors to the authorities in Great Britain.